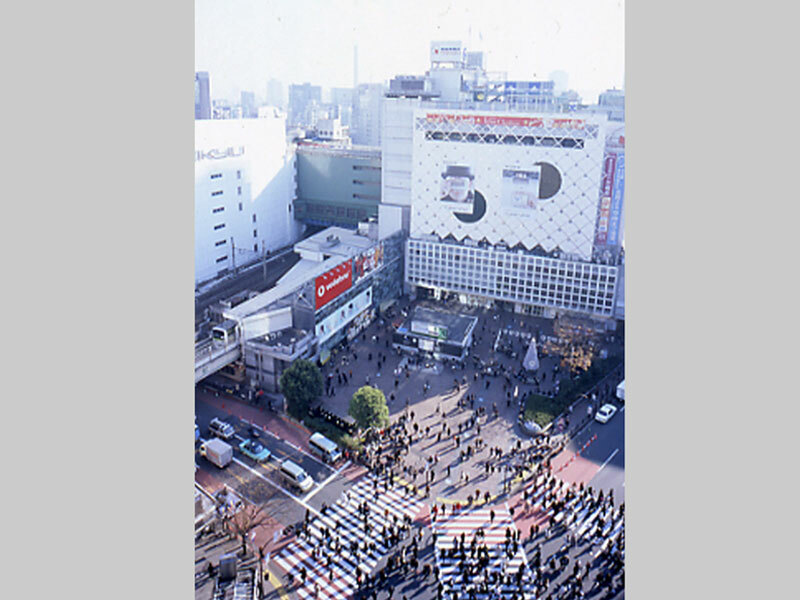 Shibuya is the district in Tokyo most popular with the younger generation. Here, one finds junior and high school students with colored hair and strange outfits roaming around, squatting on the street and even sleeping at all times of the day and night. This is a town of chaos and boisterous energy: the streets are filled with images and signboards, and the classical segmentation of architecture and advertisements has lost it’s meaning. Boundaries separating architecture from visual images, materials from non-materials, and reality from virtual reality have all but disappeared. Everything is mutually dissolved in liquid form. A station building that serves as the center of such a district should also have the same liquidity and transparency. I wanted to make architecture disappear as much as possible. 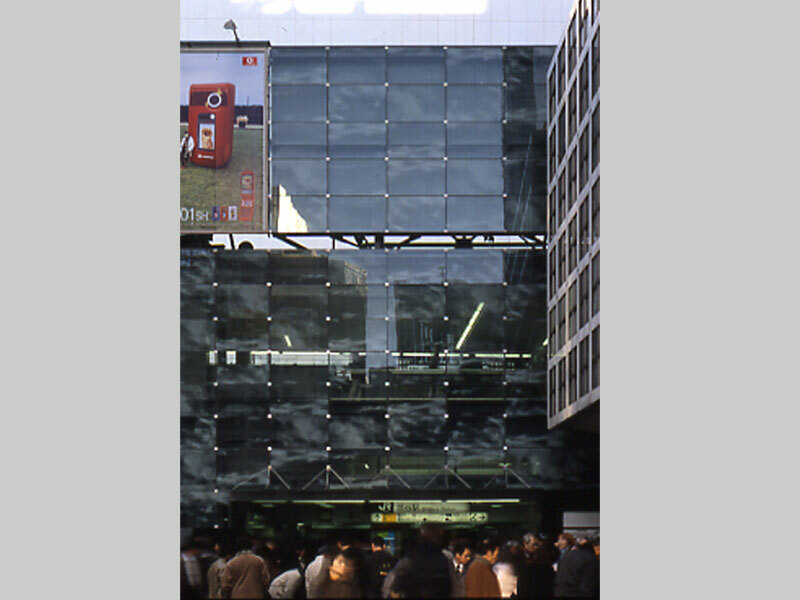 The material I chose for the façade, therefore, was glass. On this glass, I transcribed an image of clouds. 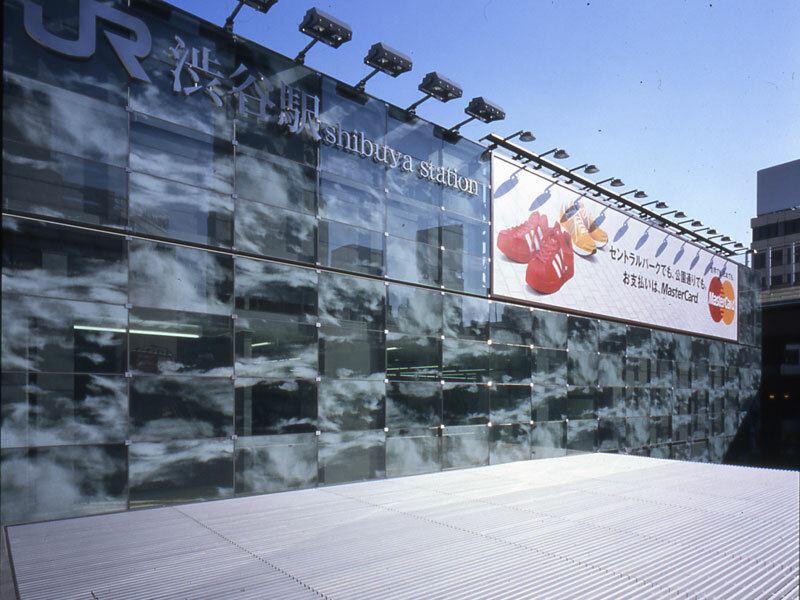 I first shot clouds in Shibuya using a digital camera, and then printed them on the glass as ceramic prints. 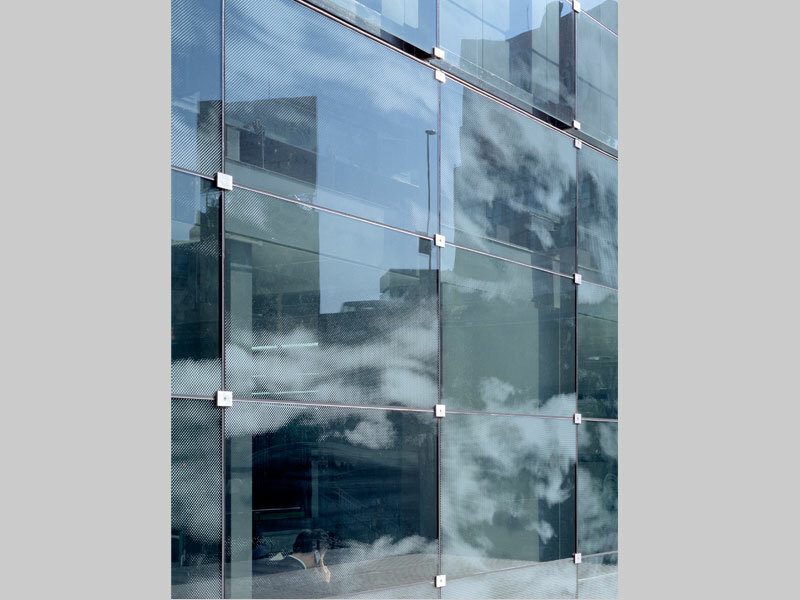 The actual clouds that are reflected on the glass overlie the printed “image” of clouds on the glass. The result is a state of ambiguity: one cannot at first glance tell which clouds are more real than the others. In transcribing the images I initially tried to place a huge cloud over the entire façade. Ultimately I took five parts of a single cloud, shuffled them, and then scattered them randomly over the façade. 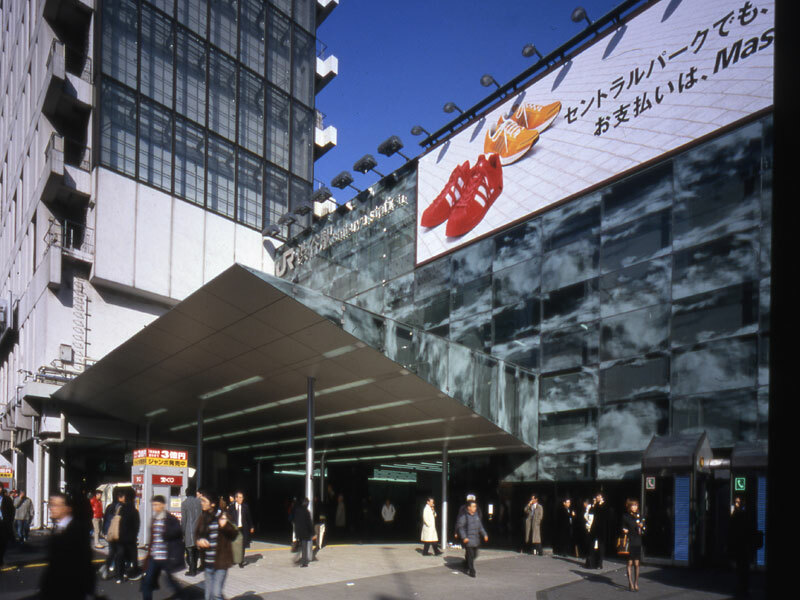 I felt that this digital, discontinuous approach was more in tune with Shibuya’s culture. Similarly, with my ceramic prints, I first wanted to make as accurate a reproduction as possible. I created a prototype using small dots. In the end, however, I enlarged the diameter of the dots to 12 mm. With this I was able to capture the sense of coolness characteristic of Shibuya. I layered three sheets of glass and printed the images in white and gray on two planes leaving a 6 mm space between them. 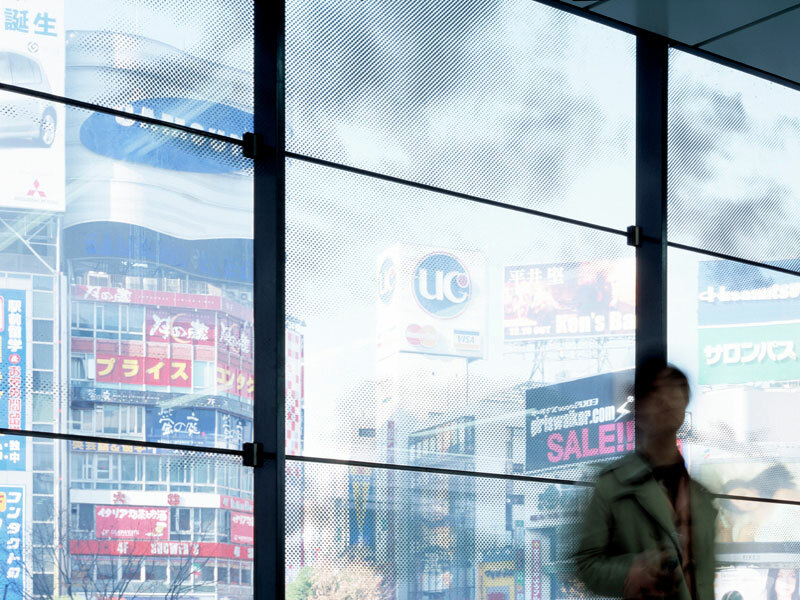 These 6 mm gaps create a type of a moré-like effect: when your perspective changes, so does the cloud’s shape and color. In terms of dimensions, we’re talking about two and a half. In other words, I had wanted to create a façade that was hung in mid-air between the second and the third dimensions; between the real and the virtual; and between materials and non-materials.